New Year is a great occasion to celebrate; probably the only event which is celebrated all over the world by everyone regardless of their nationality, language and religion. On this very special occasion, an iPhone developer has come up with an iPhone and iPod touch app to exchange contact information by giving a toast to the one with whom you are exchanging information. The toast can then be shared on the facebook wall for all your family and friends to see. 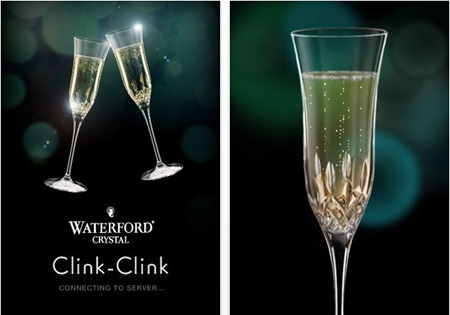 Waterford Clink-Clink has two modes, standalone and toasting with another iPhone. It responds to motion of clinking when you do the toast, with the champagne exactly moving like it is done with real glass. Here’s a video of the app, showing the said functionality in action.